The 10th March, 1322 was not a great for Burton; it came under heavy attack and much of it was destroyed. Even so, it is quite an exciting thought that the invasion troops were led by the King Edward II of England himself and of him riding into Burton on his charger. The story starts with Thomas Plantaganet, earl of Lancaster (1278-1322), who was the grandson of King Henry III. After marrying Alice, daughter and heiress of the Earl of Lincoln, the earldom of Derby was added to those he already owned and with it came Tutbury Castle. Thomas didn’t much like his cousin Edward II and felt that he would make a much better King himself. He became one of the leaders of the baronial opposition to the King; he also sided with the Scots against him. This was confirmed to the King when Robert Bruce ravaged the north of England but the Earl of Lancaster’s lands were among those spared. In retaliation, King Edward II (pictured) decided that he would lead an attack against Tutbury Castle and assembled an army in London. Hearing of this, Thomas returned to Tutbury with his own army of 30,000 men. Knowing that Burton Bridge was the only crossing over the river Trent for many miles in either direction and therefore sure to be the route taken by the King, he put much of his defensive effort into fortifying it on the Burton side. The King however, received the advice that there was a little known passable ford at Walton a few miles upstream. He therefore sent a decoy force to look as large as possible while the main body of soldiers crossed at Walton to lauch an attack on Burton from the direction of Branston. Thomas was caught by surprise and was heavily defeated at the Battle of Burton Bridge on 10th March, 1322 and retreated to Tutbury Castle, leaving most of Burton in flames. Tutbury Castle was later looted and damaged but not destroyed. Thomas was expecting reinforcements from his Scottish allies to join him at Tutbury but they didn’t show up so he was forced to escape over the Dove and flee north back to his seat and main residence at Pontefract Castle. On 16 March, Lancaster and his army had reached Boroughbridge by the River Ure. There they were cut off by the forces of Sir Andrew Harclay, a veteran from the Scottish wars, who had gathered the levies from the counties of Cumberland and Westmorland. With no more than 700 knights and men-at-arms in the rebel army and over 4,000 soldiers in the royal army, Lancaster initially tried to negotiate, but Harclay could not be swayed. The ‘Battle of Boroughbridge’ ensued but the battle was short and one-sided. The captured earl of Lancaster was escorted back to Pontefract where he was condemned to death as a traitor and beheaded by sword in front of a jering crowd on 22nd March, 1322, just twelve days after his battle at Burton. This might have been considered a lenient sentence because traitors were more commonly drawn and quartered first! 1: On the 5th/6th of March, 1322, the first royal troops build up and attack of the bridge which was successfully repulsed. Edward II arrived in person via Cauldwell on 10-11 March. 2, 3, 4: Learning of the crossing at Walton, a diversory force was left to appear as large as possible while the main force, including Edward II, crosses at Walton to attack Burton from the West. 5: The surprised earl of Lancaster’s troops set fire to as much of the Burton as they can before fleeing North. 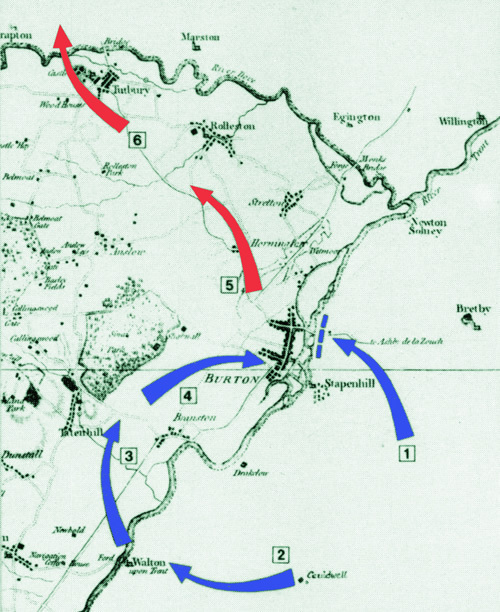 6: Lancaster’s troops cross the river Dove retreating back towards Pontefact, losing or hiding a chest reputedly containing a large proportion of 300,000 coins intented to pay the army. The unfortunate Burton was left sacked, requiring it to be almost completely re-built. Thomas was remembered as a defender of popular liberties and buried in a tomb at Pontefract. There was also an effigy of him in St Paul’s Cathedral, London. He left no children and his titles and estates were forfeited to the crown but in 1323, his younger brother, Henry Plantaganet, successfully petitioned to take over the earldom of Leicester. 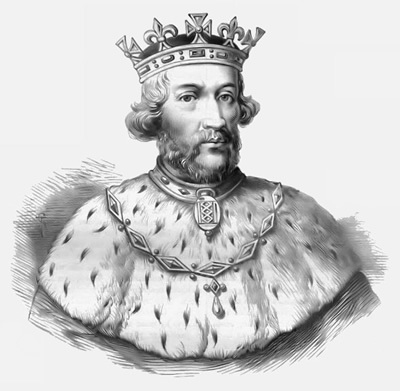 King Edward II was deposed and murdered in 1327 (although modern history favours that this was a ‘fake death’). Regardless, the throne was passed to his son, Edward III, who wrote to the pope numerous times requesting the canonisation of Thomas but this was rejected. After Edward II’s death, Edward III’s parliament posthumously reversed Thomas’s conviction so Henry Plantagenet took possession of the Earldoms of Lancaster, Derby, Salisbury and Lincoln making him the new owner of, among many things, Tutbury Castle. A large hoard of gold and silver coins hidden in three small barrels was discovered by workmen in 1831, the equivalent of well over £250,000 today, is thought to have been the payment from the Earl to his troops and Scottish allies, hidden in the bank of the river Dove as he fled for Pontefract where they remained undiscovered for over 500 years. The above example coin was one of the newest and depicts Edward II’s father King Edward ‘Longshanks’ I.